It was 1986 and I had just heard this classic for the first time. Now I was an avid record collector and DJ at the time but I had never before or again been so compelled by a song that I bought 6 copies. I knew it the moment I heard it that this was a game changer. 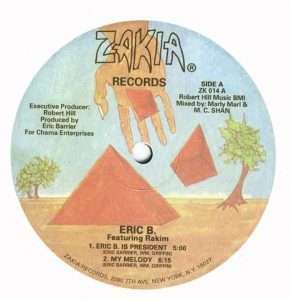 Released on Zakia with My Melody as a B side and what a B side, this record was going to change a generation. Rakim on the mic with some of the greatest rap lines ever “Thought I was a donut, you tried to glaze me” and “If he bleed he won’t need no band-aid to fix” and Eric B on the mix, this was a song that for sure changed my life and I am sure many others too. But can you detect what’s coming next from the flex of the wrist?